Knowing how to find cheap flights to Bali is simply a matter of timing and your choice of departure cities. With only a couple of exceptions, a majority of the international flights to Bali come from Australia and other points in Asia. Flights from the U.S. are typically expensive, so hopping through another point in Southeast Asia is ideal. Certainly, the busiest tourist destination in Indonesia and one of the top destinations in Asia, the island of Bali has it all. Fortunately, the explosion of tourism makes finding cheap flights even easier. Bali is so small that only one airport, the Ngurah Rai International Airport (airport code: DPS), handles all international flights and many transfers to other parts of Indonesia. Bali's airport is actually the third-busiest airport in Indonesia. A new terminal was added in 2014 to offset some of the load, but the airport was expected to hit its maximum capacity by 2017. Construction of a new international airport is planned for the north part of the island. A new international airport on the neighboring island of Lombok also helps handle the increase in traffic to Bali. 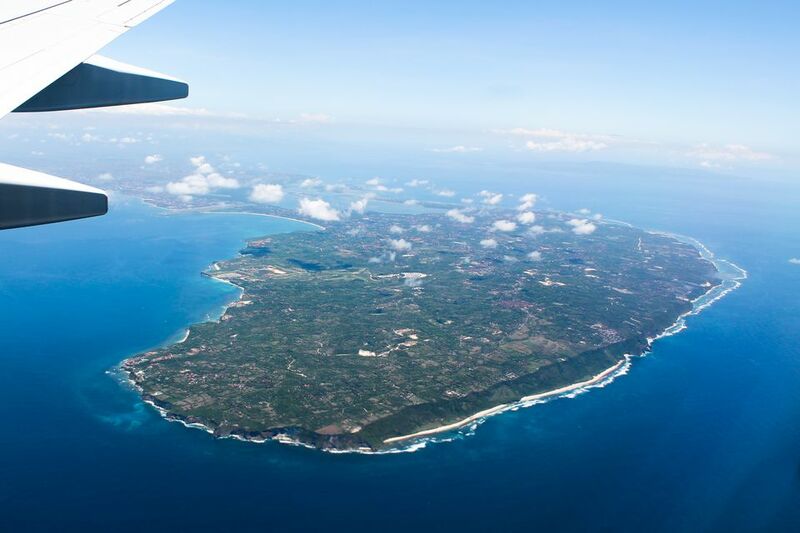 The airport in Bali is conveniently located only 1.5 miles from Kuta and the popular beaches of South Bali. Although the airport is often called Denpasar International Airport, it is actually located around 30 minutes away from Bali's capital of Denpasar. Note: Although the airport in Bali is as busy as ever, it still shuts down during Nyepi, the mandatory, once-a-year Balinese Day of Silence. A majority of the cheap flights to Bali come from Australia and other parts of Asia. Flights from the U.S. are relatively expensive, so consider splitting up your journey in a popular hub such as Singapore or Bangkok, then continuing onward to Bali with a different airline. Flights from Bangkok and Singapore to Bali are often the cheapest. Air Asia and other budget airlines offer extremely cheap flights from Kuala Lumpur, Malaysia, via the new low-cost carrier terminal KLIA2. Bali's peak season is in the summer, especially between the months of June and August. Expect to pay more for flights during the busy season. Bali, because of the close proximity and excellent surfing, is a popular destination for Australians looking to escape their winter during June, July, and August. The cheapest flights to Bali usually originate from Sydney, Melbourne, Perth, but deals do pop up from other cities. Indonesia relaxed visa requirements in 2015; now citizens from many countries can enter via certain airports (Bali is one of them) without the need to pay for a visa on arrival. The maximum stay for the visa exemption is 30 days and it cannot be extended. If you need to stay longer or don't qualify for the visa exemption, you can get a visa on arrival good for 30 days in Indonesia once you land in the airport. You'll need at least two blank pages left in your passport and a minimum of six months validity remaining. Officials prefer if you pay the visa fees in U.S. dollars, although Indonesian rupiah is accepted. Internationally-networked ATMs are available in the arrivals area so that you can get local currency. As with many popular airports in Asia, expect to be inundated by offers from porters, touts, and drivers once you exit the airport. Do not allow anyone to pick up your bags unless you are willing to pay them. To avoid extra hassle from drivers, purchase a fixed-rate coupon for an official taxi (walk to the right as you exit the airport) where a driver will be assigned to you. Ambitious backpackers and ultralight travelers can actually walk from the airport to accommodation in Kuta. Alternatively, you can walk five minutes just outside of the airport area to flag down a taxi or bemo -- Indonesia's public minivan. Make sure the driver uses a meter or negotiate your fare before you get inside. The airport at Bali, unfortunately, has a long reputation of corruption and petty scams aimed at travelers who are leaving. The departure tax—to be paid at a designated kiosk on your way out—is 150,000 rupiah (around US $15). If flying elsewhere in Indonesia, expect to pay only around US $4 for domestic departure tax. This tax is not included in your ticket price so save some local currency to pay on the way out! Unless you are leaving with antiques, question anyone who claims that you have to pay a duty on souvenirs or other gifts that you purchased.